Joe Yokai has spent the past 60 years trying to bury the past. The 88-year-old Nisei war veteran lives a solitary life, insulated in a private world that keeps him safe and secure but also isolated. Joe's guarded existence is irrevocably changed when a half Japanese-American reporter named Kevin O'Hara inadvertently intrudes while researching a story about World War II. 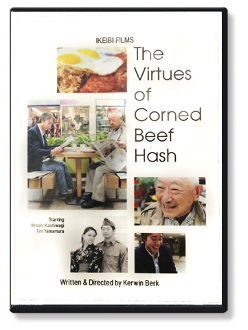 Shot almost entirely in San Francisco's Japantown, 'The Virtues of Corned Beef Hash' explores the developing friendship between the two men through a series of conversations they have over breakfast at May's Coffee Shop. Through Joe, Kevin is able to learn more about his Japanese-American roots. And through Kevin, Joe is finally able to face his past - and to come to terms with it.